I crave all things food and devour foodie news. Staying on top of restaurant openings, cookbook releases, chef sagas, reviews, awards, menu trends and New York’s culinary calendar is something of a religion to me. I draw most of my epicurean knowledge from friends in the biz, bloggers I trust, local newspapers and countrywide magazines, but without a doubt, Tasting Table has become my most reliable resource. Daily emails chockfull of hungry happenings are delivered straight to my inbox, so I can catch up on the full foodie lowdown without lifting a finger—master chef recipes, must-try edibles, adventurous potables, gadget suggestions, travel recommendations and dining reservations. With editions in NYC, Chicago, LA, San Fran, DC and a National publication, these food-forward newsletters have their “forks” on the pulse of the most drool-worthy hotspots across the country. 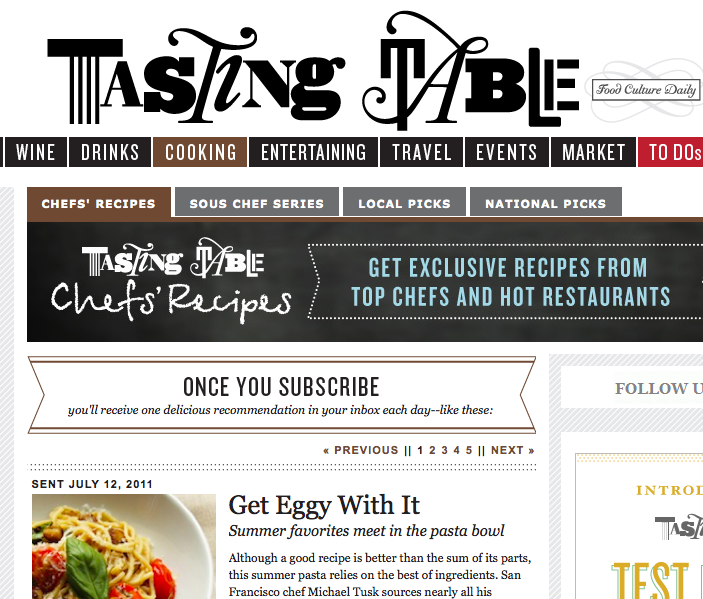 But wait—the Table just got tastier: Tasting Table recently released a free iPhone App. After playing around with it for a few weeks, I might concede that Tasting Table To-Go is even better than the original! To start with, the smartphone app is not a redundant and regurgitated version of their daily e-newsletter…it’s its own thang. It exudes simplicity and user-friendliness, making it extremely easy to operate. Best of all, it doesn’t clog up my inbox! With the added flexibility to change city editions with a mere tap of my finger, I jump from Chicago to San Francisco without sifting through emails (or boarding a plane). The interface is clean and simple, with the content organized into five distinct categories: Articles, Nearby, Short List, My To-Do List and More. With confidence, I can assure you that reading the content is a much more pleasant experience on the app than using an Internet browser—it’s easier on the eyes. The Nearby feature is exclusive to the application. It’s basically a useful GPS function built into the app, navigating you to nearby restaurants, bars and shops recommended by Tasting Table. It’s perfect for an impulsive night-out when you haven’t decided where and what to eat for dinner, but for those who prefer to pre-plan their dining experience, the Short List records all the hotspots that TT’s editors are obsessing over. The List includes a fun legend that explains whether the place is new, expensive, or good for lunch/dates/ groups, etc.. The To-Do list is a space to save all your bookmarked recommendations on an interactive map; described as a “personal secretary for your appetite,” it’s a check-off list to keep track of and share everything you’re craving. So what’s the verdict? If you haven’t guessed, I deem Tasting Table To-Go completely Crush-a-Belle. 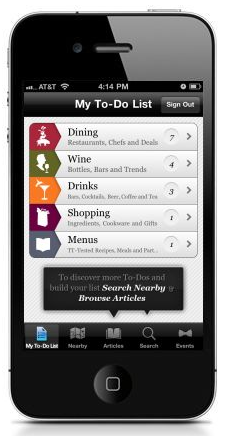 It’s easy to use, well organized and tastefully curated, a no-nonsense, practical app for foodies with smartphones. So what if you have delete the occasional promotional email from their sponsors, and I’ve never had success reserving a seat at one of their events. They’re popular and profitable; I cannot blame ‘em, but I advise joining them. Share your To-Do list with me on Facebook and Eat it Up!